Phantoms celebrate their overtime winner against London Raiders. Photo: Bob Hillier. The main course will have to be pretty special to follow this starter . . . The opening instalment of Peterborough Phantoms’ crucial NIHL Division One South weekend could hardly have provided more drama last night (March 3). Leigh Jamieson scored the overtime winner for Phantoms against London Raiders. It was an often worrying, but ultimately wonderful, night for the city side as they came from behind three times before snatching a priceless 4-3 success against London at Planet Ice. The winning goal arrived with just 23 seconds of overtime remaining courtesy of Leigh Jamieson. The celebrations that followed it highlighted how valuable his pinpoint finish into the roof of the Raiders net could prove to be. In the process he secured a sixth successive victory which eased Phantoms two points clear at the summit ahead of a likely title decider when Basingstoke roll into Bretton this evening (March 4, 5.30pm). Any thoughts of Phantoms facing a simple task against a Raiders side they thumped 6-1 on their new Romford ice the previous Saturday were soon dispelled. Glen Billing scored a classy finish for Phantoms against London Raiders. Less than three minutes had passed when Olegs Lascenko forced in the opener, but it was cancelled out by a moment of class from a player who grew up in the visitors’ youth system. Glenn Billing cut out a weak pass from London netminder Michael Gray, who had rushed out of his crease, and finished with precision to level short-handed. It was a rare aberration on the part of Gray, who went on to be a brilliant last line of defence for London. Aside from a needless punch on Phantoms forward Will Weldon during the third period (for which he rightly received a penalty), he oozed class and was a worthy (and strangely accurate in this sport) recipient of the man-of-the-match accolade. He was peppered during a second period of home dominance, but kept out all 17 shots on his target while the ruthless Raiders made one of their three efforts count. A Phantoms breakdown led to a London breakaway that was finished by impressive import Juraj Huska. 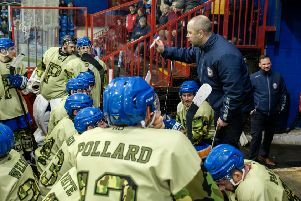 It left Phantoms trailing as they went into a crucial closing period, but they needed only 50 seconds to haul themselves level a second time as player-coach Tom Norton struck on a powerplay. But parity was restored for little more than a minute as Phantoms were quickly undone again. Lascenko fed Huska to light the lamp on a delayed penalty and leave Koulikov’s men in need of another response. It arrived 10 minutes later – and following a series of fine Gray saves - as a Darius Pliskauskas shot into traffic received a telling kiss off the stick of captain James Ferrara as it crept inside the near post. A couple of smart Euan King saves ensured Phantoms held out during a Raiders powerplay before London man JJ Pitchley picked up a penalty in the closing seconds of regulation. Phantoms couldn’t make their numerical advantage count as the clock ticked down and it was a similar story in the opening chunk of overtime. Clearcut chances were surprisingly few and far between during a breathless five minutes, but Jamieson ensured Phantoms made their big opportunity count with the prospect of a penalty shoot-out looming. Now bring on the Bison . . .